I have joked repeatedly about the altered consciousness of playing with LEGO bricks that extends to the real world. In other words, you know you're hooked when you start to see objects, vehicles, buildings, really anything, that makes you say, "I could build that out of LEGO." I am glad to see that someone has taken my words to heart. 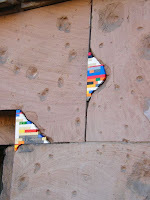 Artist Jan Vormann is busy repairing actual buildings with LEGO bricks. After a successful street installation in Tel Aviv, he's recently begun repairing WWII-damaged buildings in Berlin. He's also one step closer to realizing my dream of an actual house built out of LEGO bricks. Now that would be a sustainable building.